House has exhibited in museums and galleries across the country, as well as internationally. 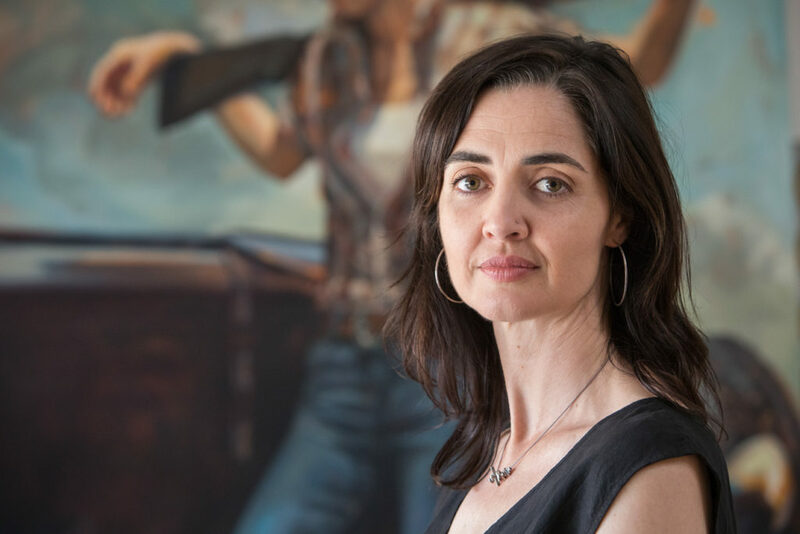 You can find her work in both public and private collections, including The Booth Museum of Western Art, Austin City Limits Music Festival, New Mexico State University, Prentice Women’s Hospital, and American Campus Communities. She has been featured in Fine Art Connoisseur Magazine, Vice Magazine’s The Creators Project, the BBC News, This is Colossal, Upworthy, GirltalkHQ, Hypertext, Refinery29, Boing Boing, Fubiz, El Diario (Spain) and Tabi Labo (Japan). She received a BFA from the Nova Scotia College of Art and Design, an MS from Texas A&M University in computer graphics and an MFA in painting from the University of Texas. She studied classical painting and portraiture at the Schuler School of Fine Arts in Baltimore, MD. She is an Assistant Professor in the Visualization Department at Texas A&M University. She is a member of the Baha’i Faith. In the Re•Western series House projects contemporary women into heroic roles formerly played by western movie icons such as John Wayne, James Dean and Gary Cooper. By utilizing the gender flip, House points to the gendered nature of the hero in culture and begs the question, “What if John Wayne were a woman?”. Re•Western debuted in 2013 as a joint show with sculptor Dana Younger at the G Gallery in Houston. Since that time, the series has exhibited nationally and most recently internationally to the Leeds College of Art’s Blenheim Walk Gallery in Leeds, UK. House’s latest painting and drawings series, Sum You Some Me, depicts the head and shoulders of women interrelating with the landscape. The resulting tension between the figure and the natural world creates a fertile interpretive space within which the viewer can project and reflect on his or her own sense of self, nature, and wholeness. Sum You Some Me debuted in January of 2016 as a two-person exhibition, with sculptor Dana Younger, at Aquinas College’s gallery in Grand Rapids, Michigan. An expanded version of the show debuted at the Dougherty Art Center in Austin, TX.